For many experts on performance art there can be no repetition of a 1960s or 70s work, only a re-enactment. A performance, they argue, cannot be repeated because the reaction of an audience is an uncontrollable factor and the artwork itself depends upon this engagement for its completion. This interaction between performing artist and audience is undermined, however, in Jack Goldstein's work, with its disconnection of the artist from audience. In his early pieces this was achieved by not having an audience present at all; these works took place either in his studio or at anonymous sites around Los Angeles. In his later performances this absence was reversed, as Goldstein removed himself from the work; Two Fencers (1977) and Body Contortionist (1976), for instance, both rely on the employment of professional athletes and performers. 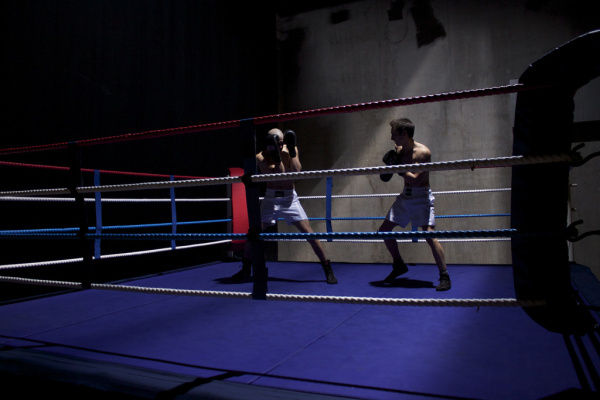 Therefore Nottingham Contemporary's recent restaging of Goldstein's Two Boxers (1979) - a performance lasting five minutes in which two boxers enter a red, white and blue ring, exchange unscripted punches and stop after three minutes - did not have to deal with the problem of how to cast a stand-in for the artist himself. The event was re-created from a detailed examination of a film of Goldstein's own 2002 reprisal of the work that was made on the occasion of his retrospective at the Whitney Museum in New York, shortly before his death. Chrissie Iles, who curated the 2002 exhibition and worked with him on that performance, was in Nottingham to introduce the work and in her discussion of his practice was careful to distinguish his pieces as 'score-based'. Iles argues against restaging any performance works that are not score-based, as performances depend intrinsically, she says, on both the presence of the artist and their original context. The suggestion of a need for a score, by which she means a written template for the performance, however, draws attention to how re-performance is not a contentious issue for other art forms; indeed both music and theatre depend upon the repetition and reinterpretations of the same piece and how it is re-created anew in each manifestation. Goldstein is most widely known for his short colour films made in the mid- to late 1970s and for his inclusion in the now legendary 1977 exhibition 'Pictures', curated by Douglas Crimp and Helene Winer, that also featured the work of Troy Brauntuch, Sherrie Levine, Robert Longo and Philip Smith. The exhibition's importance has been seen to lie in its inauguration of image-based practices and a return to representation that became a characteristic strategy of 1980s art production. By the time Crimp turned the exhibition into an essay for the pages of October in 1979, although Goldstein remained a central part of his discussion, it was Cindy Sherman, whose work was not included in the original show, who became the defining artist of Crimp's argument: 'Those processes of quotation, excerptation, framing and staging that constitute the strategies of the work I have been discussing necessitate uncovering strata of representation. Needless to say, we are not in search of sources or origins, but structures of signification: underneath each picture there is always another picture. '1 This understanding of the image as free from any foundational signified seems antithetical to a way of working that depends on the physical presence of either performer or audience. But in Crimp's discussion of Goldstein's work it is presence that is key, for it is that which indicates the theatricality of a work, a term he directly borrows from Michael Fried's famous attack on Minimalism in his essay 'Art and Objecthood' (1967). Crimp indeed starts his 1979 'Pictures' article with a lengthy discussion of Fried's argument, pinpointing the significance of Fried's demand for 'presentness' as a qualifying condition for visual art practice, defining it as diametrically opposed to the condition of theatre, for 'at every moment the work itself is wholly visible'.3 However Goldstein's work seems to make this division untenable. Although performance necessarily exists in time, as a performance it has duration, which is to be understood in a number of different senses - particularly since the way Goldstein in this performance exposes the precarious nature of time almost makes duration collapse altogether, as I will suggest below. For The Boxers also has a sense of what Fried might, albeit reluctantly, identify as presentness, although it does not have 'no duration', which is what Fried claims for modernist painting and sculpture. Rather this performance has an enduring 'presentness' that in retrospect manifests itself as a smart simplicity - from the white shorts the boxers wear to the red, white and blue ring they fight in: it has a formal freshness that marks it in the mind's eye. That is to say, it is not a reflective or meditative work. For even if the audience only sees a brief instant of the work they will have a fairly tight grasp of what the work entails, and if they are waiting for a climax or a denouement, neither come. The performance has no sense of narrative but instead has a literality and perpetual present exemplified by the final minute in which the boxers ultimately stop fighting. Goldstein's Two Boxers is a masterclass in duration. Although only five minutes, time is harnessed to reveal the full range of how we sense its passing. A red, white and blue boxing ring is dimly lit, accompanied by the somewhat disarming sound of German marching music. Two male muscle-bound figures enter the ring, wearing long white shorts. As the music subsides they begin to box, as a slow strobe objectifies their action so that each gesture appears as distinct moves rather than a fluid act, and the only sound is the soft cushioned punches of boxing glove on flesh. There are two speeds put in play by the work: the first, the visual, is dislocated from a naturalised sense of time by the effect of the strobe lighting, which slows down our perception of this live event, allowing the audience to examine each move so as to appear almost as if each one was choreographed. As the boxers move in and out circling one another, the dance of their bodies responding to one another somehow stills their movement. This focus on the physical is also compounded by the structure of the ring itself, which dissects our view of their physique with the exactitude of an anatomist. However the aural rhythm of cushioned punches on flesh and the squeak of their shoes corresponds much more closely to a naturalised sense of time, and the discord between the visual and the aural dimensions of the work has the effect of a desychronisation. After three minutes the boxers stop and hold their poses still, and the music returns. Bathed in red light they pant visibly yet despite their obvious, and real, fatigue the light gives the scene a sense of artifice - the surface is somehow broken, and the image proved to be fallible. We witness time not as a sequence of similar events or units continuing in a series in which each moment is alike, but instead as different durational periods. Goldstein's manipulation of duration shows that time cannot be distributed spatially. In such a way the performance opens out a different sense of duration - one that is not defined by the artist, performer or audience - and one different from the sense of temporality as defined by Minimalism, which is dependent on the spectator. Two Boxers dismantles the dichotomy between presentness and duration by suggesting that time can exist outside the subject and allows for the possibility an inhuman duration. Goldstein allows for a sense of performance that is not reduced to the relationship between artist and spectator and thereby pushes beyond the oscillation between absence and presence; it is a performance that transcends the subject.